Ryan Went From Skinny To Shredded! Putting on 50 pounds of solid muscle is not an easy feat. Ryan made it happen through discipline and perseverance. You can too! I used to be a professional motocross racer, and anyone who is familiar with the sport knows what it does to your physique. When I was racing competitively I stood at 6 feet and 135 pounds! I suffered a very serious injury (compression fractured 4 vertebrae in my back, broken ribs and a bruised heart) and I decided to step away from racing. During my recovery I was pretty depressed with how I felt and especially with how I looked. Everyone always referred to me as the "skinny, lanky kid" and I remember I looked into the mirror one day, unhappy with how I looked and said "wow, I need to do something about this." 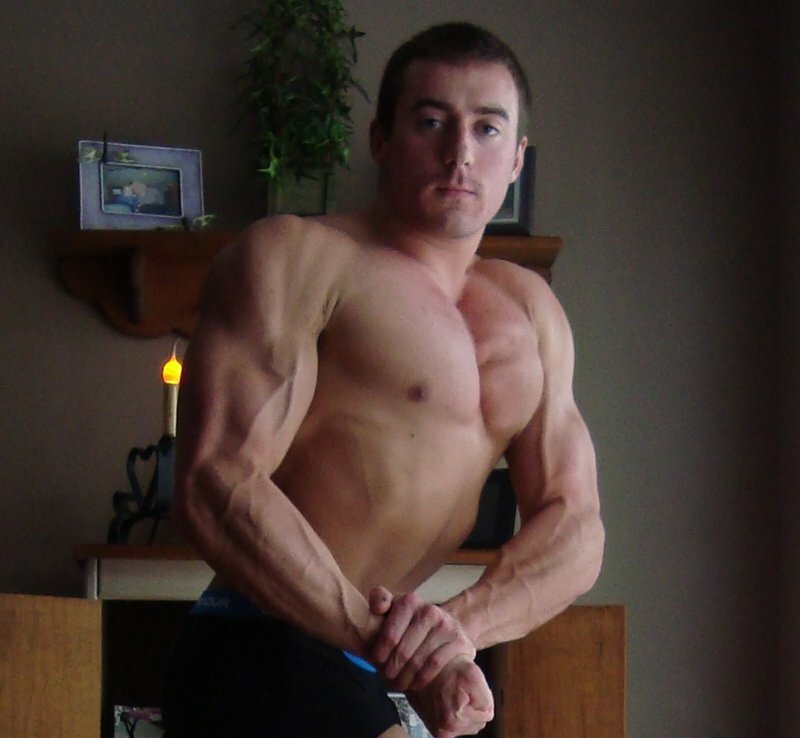 I'm a very competitive person and needed something to push myself at, and I soon fell in love with bodybuilding. I started training about 5 years ago, in late 2006. The only thing this barn door back is missing is a latch. And horses inside. 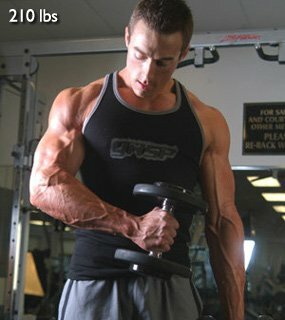 I did a TON of research on Bodybuilding.com forums and learned as much as I possibly could and starting putting it all to use. I am the type of person that if I commit to something; it's 100% or don't do it at all! 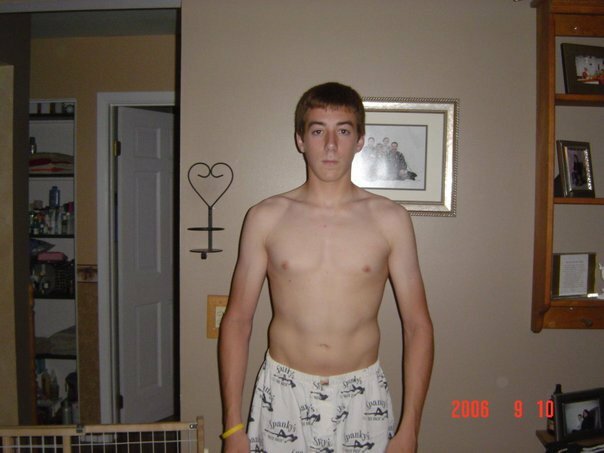 I remember when I first started getting into working out and eating correctly all of my friends thought I was crazy, and always said "you will never get muscular or ripped like those guys you see in magazines." I made it a point to prove them wrong! 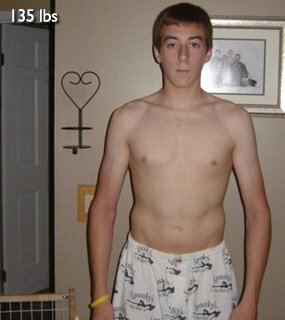 I gained around 50lbs within the first year, I seriously changed my lifestyle and my friends were blown away. Now being a full-time personal trainer/nutritionist, I use this example with my clients all the time. Don't EVER put limits on yourself, because if you really commit you can do amazing things! Staying consistent with my workouts and diet was the biggest role in my progress and how I got to where I am today. Those pectorals are now visible via satellite imagery from outer space. I have used Optimum Nutrition's Gold Standard Whey since Day 1. My diet is simple, but it works great! I always eat 4-5 solid meals per day, and also have 1-2 protein shakes (depending on my goal at the time). This is a basic outline of my diet for cutting body fat, when I am looking to bulk up I add more carbohydrates into the later meals. I am always changing up my training, but here is a sample of one of my favorite workout routines. I like using a Push/Pull/Legs format going 2 days "on" and 1 day "off". I stick to the basics and lift as heavy as possible. My volume tends to change depending on how I am feeling; if I feel really beat up and feel like I hit the muscle group good with 2 sets, I move on. My biggest tip for staying motivated is to keep your ultimate goal in mind all the time! I use this myself and also tell clients to do this; ask yourself this question every night when you're lying in bed … "Did I do everything I could today to reach my goal?" If you can continue to say "yes" to this question, I guarantee the results will be more than enough to keep you motivated! No longer content to sit on the sidelines of life these guys have gone from wimp to pimp! Done with giving excuses, these ladies have given themselves the bodies they always wanted! These amazing teenagers have made changes in their lives that most adults only dream about! Age is no excuse for these over 40 women & men who have decided to feel and look young again!